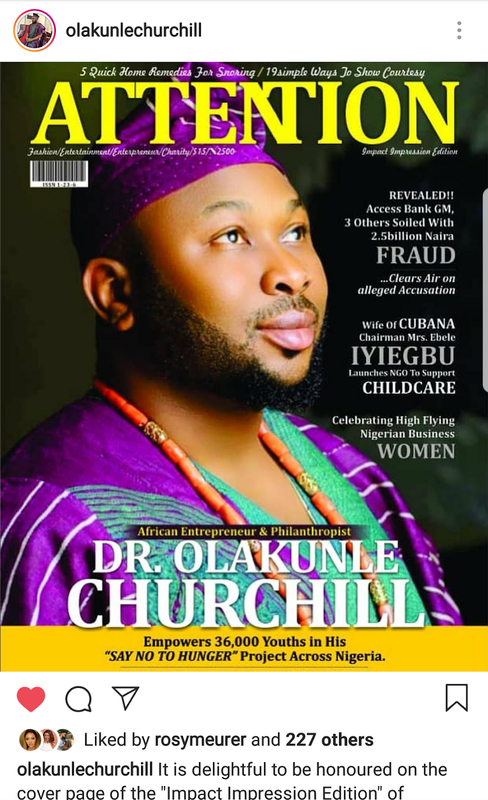 Attention Magazine has unveiled it's newest publication, tagged "The Impact Impression Edition, with popular African-Nigeria Philanthropist and Enterpreneur, Dr. Olakunle Churchill adorning it's front cover in a sheen Yoruba attire that expresses his vibrant love for motherland. The Impact Impression Edition, was designed to promote the significant impacts of outstanding personalities, Institutions, groups and initiatives within Nigeria and across the world. According to Mr. Nwankwo, the Editor in Chief, he explained that the 12 edition of Attention Magazine is a juxtaposition of engaging contents that will be thrilling the consciousness of readers across several sectors. 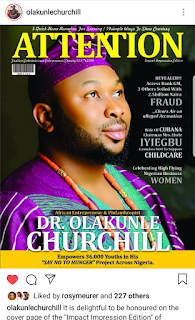 In a reaction from Dr. Olakunle, who was adorned on the front cover of the impact impression, he says, "It is delightful to be honoured on the cover page of the "Impact Impression Edition" of *ATTENTION MAGAZINE. * An edition that centers on Impacts, innovations, enterpreneurship, artistic articles and informative contents". He also went further to appreciate the management editorial team of the Magazine. He admired their efforts and sacrifices at making this edition a huge success. Attention Magazine remains one of the visible and fastest growing print publication in Nigeria. The Marketing Executive of magazine highlighted some of the exclusive network of availability, stressing that copies of this edition will be available at Dana Airlines, High Commissions, embassies, Airports and several other top rated platforms.